Here's cheers to healthy hydration for pregnancy and beyond! Here’s cheers to healthy hydration for pregnancy and beyond! Growing and feeding a baby is thirsty work. Wouldn’t it be awesome if you could know that what you’re drinking has been designed especially with you and your growing baby in mind? Consider this bottle of goodness the answer to your prayers, mums-to-be and ladies with babies. But don’t take our word for it, here’s what some real mums had to say about aquamamma. You’ve already heard us wax lyrical about aquamamma – the delicious drop created by Sydney obstetrician Dr Rob Buist with the prime objective of helping to keep pregnant and breastfeeding women hydrated. Low in sugar and sodium, with added folic acid, it’s designed to help keep mums feeling good, even if they’re experiencing morning sickness. With a toddler and breastfeeding bub to keep happy, Natalie was keen to road test aquamamma and its ability to keep her hydrated and feeling good while on the go. 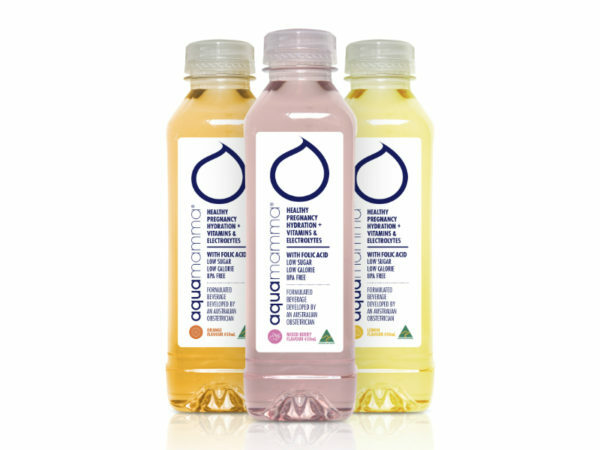 Natalie said she’s likely to recommend aquamamma to her pregnant and breastfeeding friends. This busy mum is balancing a demanding career, and a breastfeeding 18-month-old, with Laina admitting she often forgets to drink and eat properly. While trialling aquamamma, Laina had a bottle in her handbag to make sure she stayed on top of her thirst while rushing in and out of meetings. “All the flavours taste great, but I personally like the lemon as it’s very subtly sweet, and I don’t usually drink flavoured drinks. Karen loved her orange aquamamma so much, she’s happily recommending it to her friends.